"In Nature nothing remains constant. Everything is in a perpetual state of transformation, motion and change. " In establishing woodland, there are difficult decisions to make in deciding which trees to keep and which must be sacrificed; and so Stephen and Claire are having to decide on the thinning to take place to give the space for remaining trees to develop and grow to maturity. Part of this process results, in forestry terms, to the creation of something called 'brash'. Now 'brash' is an interesting word because if you look in the dictionary the first definition is something like: impertinent; impudent; tactless; and I think if we were to look at it from a tree's perspective, getting unceremoniously chopped down by such a short lived species as humans, then that definition hits the spot just perfectly. Perhaps a tree is just a 'utilisable stem component'; I prefer to think it is more. Conceivably much more. That aside, it is the forestry term that we are using. 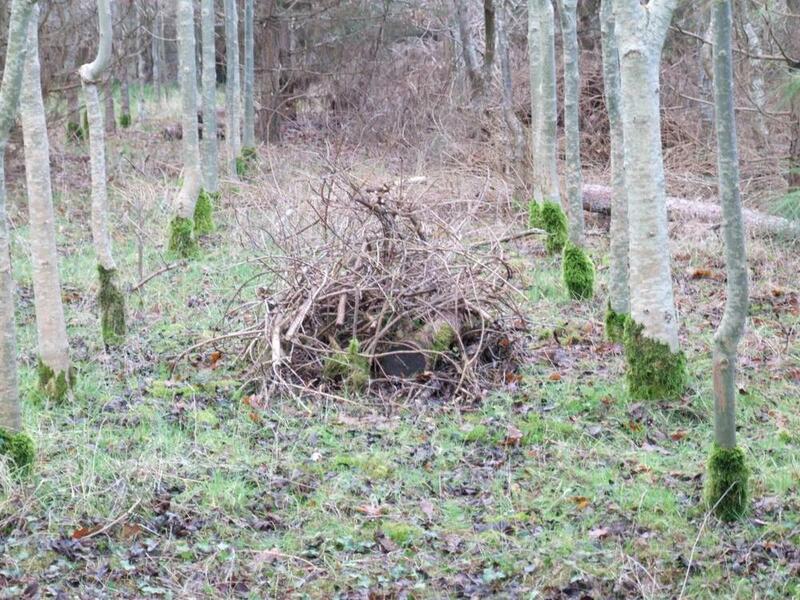 For us, the 'brash' that results from the thinning is the material to create the mounds and structures. They vary from rough piles to more complex arrangements where larger pieces of trunk are at the centre (for mycelium and beetles) with layers of smaller material built up in layers over that. These other layers also form habitats. Outside of this it is possible to use the brash to form some aesthetically pleasing shapes, lines and textures. Some are done with nesting birds in mind, others as experiments to see what can be done. For example, I did a nested open structure for Stephen's granddaughter to look at. When Claire asked us to do something for a toddler, I thought it would be nice to have a tiny structure at the centre, a slightly larger frame over that and a larger outer - and that this would hopefully be interesting from a child's perspective... of course that might just be my inner child's view of the world. I don't mean childish as it is commonly used, but a child-like view of the world where things are new and strange and mysterious, and a small structure at the centre would look similar in perspective to how some of the smaller piles look to an adult. In the end it evolved on it's own because we just use whatever materials are at hand. By chance it ended up being just high enough for me and Miranda to stand in... which makes for an image that is both ridiculous, bizarre and somewhat surreal (in a silviculturally' [sic] mind-bending way). The people who came along on the logs for labour scheme have done a vast amount of work over the last couple of years - Miranda and I only started in November 2014. The sheer volume of brash being generated was why we started doing larger structures, although Claire will tell you that some of the larger structures are indicative of my incipient megalomania, I prefer megalithomania. So it goes. Anyway, brash is what we use to make the structures and mounds and it's a very pleasant activity in itself. Of course, they only look their best for a short time, a pleasing moment, but the really interesting stuff is what happens after they are made.